THE British Government said it intended to bring back Prime Minister Theresa May’s Brexit deal for a third vote in Parliament on Friday to avoid a chaotic no-deal divorce from the EU. May’s throw of the dice comes a day after her dramatic pledge to resign in order to persuade her rivals to finally back her vision for breaking Britain’s 46-year bond with the European project. 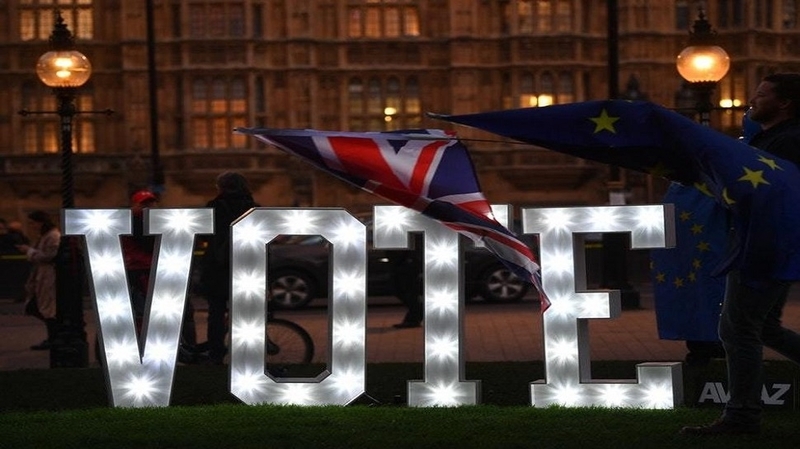 Even after hours of debate, the British Parliament on Thursday failed to give an outright majority to any of the eight alternative Brexit options including no deal and Labour’s alternative deal. As many as 30 Conservative MPs have voted against Theresa May. According to the ‘CNN’, calling for a second referendum received the highest numbers of votes. Along with that, an instrument was also passed with 441 votes in favour to change the date of Brexit from March 29 to May 22, or if possible, April 12. The Government’s back is against the wall as it tries to avert potential economic disaster and financial panic in the coming weeks. Meanwhile, the Commons failed to find a majority for a way forward after voting for eight different options, including revoking Brexit, leaving without a deal, creating a customs union and backing a confirmatory referendum on any deal, on Wednesday. After several hours of debate, none of the eight options emerged as a front-runner among MPs. The House of Commons leader Andrea Leadsom said the Government was trying to secure permission for a third vote from Parliament Speaker John Bercow. He already rejected a similar attempt last week after ruling that the version May was bringing back was essentially the same text that lawmakers had already twice rejected by resounding margins. “We recognise that any motion brought forward tomorrow will need to be compliant with the Speaker’s ruling and that discussion is ongoing,” Leadsom told the chamber. Anxious EU leaders last week offered Britain a Brexit extension until May 22. But it is conditional on Parliament voting through May’s deal by Friday -- the day Britain was originally scheduled to leave. Failure to pass the deal could mean a no-deal Brexit as early as April 12. Businesses fear that will cause economic chaos. To avoid that, the British Government must spell out what its next steps should be. Britain might then seek a much longer extension that would mean it has to hold European Parliament elections despite having voted to leave the bloc. May’s handling of Brexit has provoked both anger and frustration as well as ridicule. She played what may have been her last political card on Wednesday by promising to quit once the messy divorce process is complete. “I know there is a desire for a new approach -- and new leadership -- in the second phase of the Brexit negotiations and I won’t stand in the way of that,” May told a packed meeting of party members. Her promise won over some likely contenders for her job. May became premier shortly after the 2016 referendum in which Britons narrowly voted to leave the EU. Former Foreign Minister Boris Johnson said he would now back the premier “on behalf of the 17.4 million people who voted for Brexit”. But the Prime Minister’s position was undermined when her allies in Northern Ireland’s Democratic Unionist Party (DUP) said they would continue to oppose the deal. The small party props up May’s minority Government, giving it a decisive role in the political saga that has consumed Britain and left its EU partners increasingly perplexed. The DUP is opposed to provisions in May’s deal to keep a free-flowing border between Britain’s Northern Ireland and EU member Ireland. The group worries that this would give Northern Ireland a different economic status from mainland Britain and separate it from the mainland. “For us, the most important thing is a union,” DUP leader Arlene Foster told RTE television on Friday. “I don’t make any apologies for that.” Downing Street said on Thursday that “discussions with the DUP are continuing” as the Government tries to piece together a majority from a patchwork of conflicting interests.